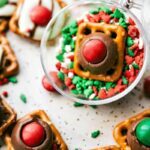 The BEST and easiest 3-ingredient Christmas candies — perfect for giving to neighbors, bringing into work, taking to a party, or enjoying with your family! 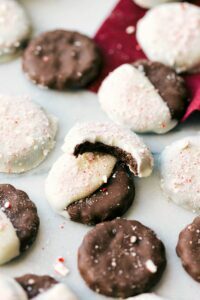 Homemade white chocolate peppermint hearts, pretzel hug/kiss bites, thin mint oreo cups, and easy turtles. 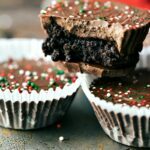 This video above quickly overviews these four Christmas candies, but the instructions give you more tips/tricks/details for each treat. Enjoy! First up, WHITE CHOCOLATE PEPPERMINT HEARTS. These make such a festive gift. 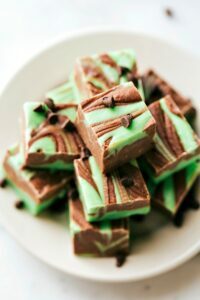 They might look a little complicated, but they are one of the easiest treats ever! Not to mention delicious — peppermint and white chocolate pair so well together! 6 ounces white chocolate high quality chips work/taste best! Prepare a tray with parchment paper and set aside. 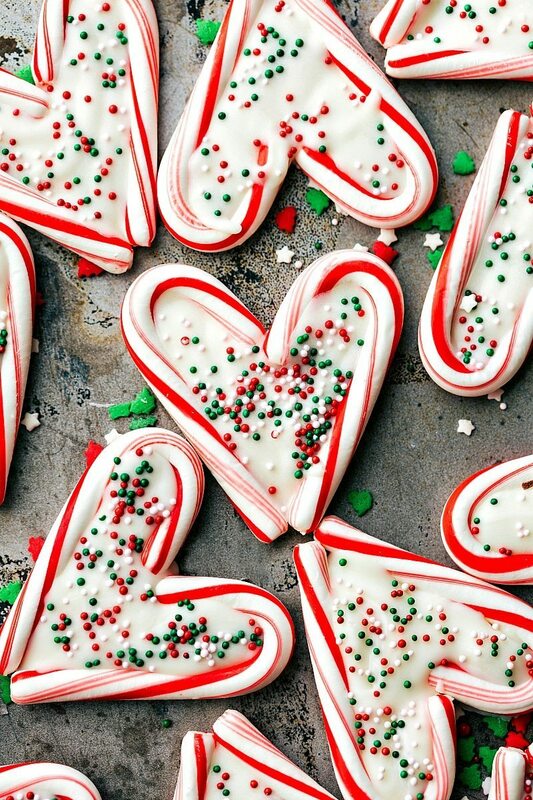 Set the candy canes on the tray -- two together to form hearts all over the tray. Melt the white chocolate in the microwave in bursts of 15 seconds stirring in between each burst for 10-15 seconds. Patiently melting the chocolate will make sure it doesn't burn! If needed add the oil to slightly thin the chocolate. Add very slowly and just if the chocolate is too thick. Pour the chocolate into a plastic bag and snip off the tip with scissors. 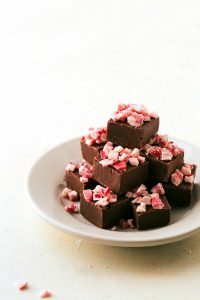 Pipe the melted chocolate into the centers of the candy cane treats. Gently wiggle the candy canes to get the chocolate smooth. Cook time refers to setting time. Again, SO easy! I mean usually with 3 ingredients all things are, but these and the turtles are especially uninvolved. Plus these are a fun treat to get kiddos involved — my two LOVED unwrapping all the kisses, hugs, and rolos. My toddler also loved setting a kiss or hug on top of the pretzel. I like the square pretzels best for these, but regular twist pretzels work great as well! Line a tray with parchment paper and place the pretzels on the tray. Unwrap the hugs/kisses/rolos and place on top of the pretzels. Bake for 3-4 minutes or until the hugs/kisses/rolos are soft but not melted. Press an M&M candy into the center of the hugs/kisses/rolos right out of the oven. 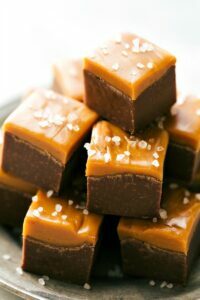 *I tried out caramel kisses for these and they didn't work -- caramel oozed out everywhere. Stick to solid chocolate kisses. **I've had a few people report issues with the kisses crumbling; this means the oven was too hot or the chocolate was baked too long. I would recommend trying 1 rudolph nose at first to test. If it crumbles, reduce the baking time for the rest. Do not use convection oven settings. Third in the line up: THIN MINT CUPS. 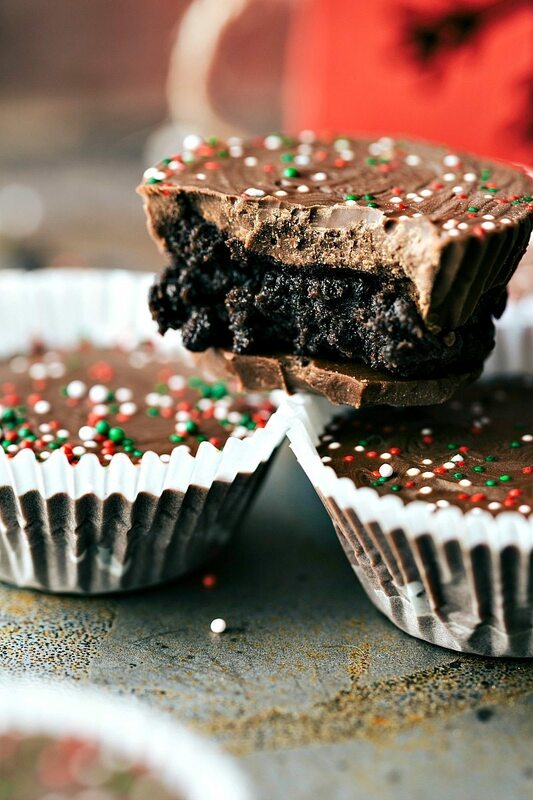 These are a mix-up between Reese’s cups, thin mints cookies, and Oreo balls. I know those don’t all sound like they go together, but this has become one of our all-time favorite treats. 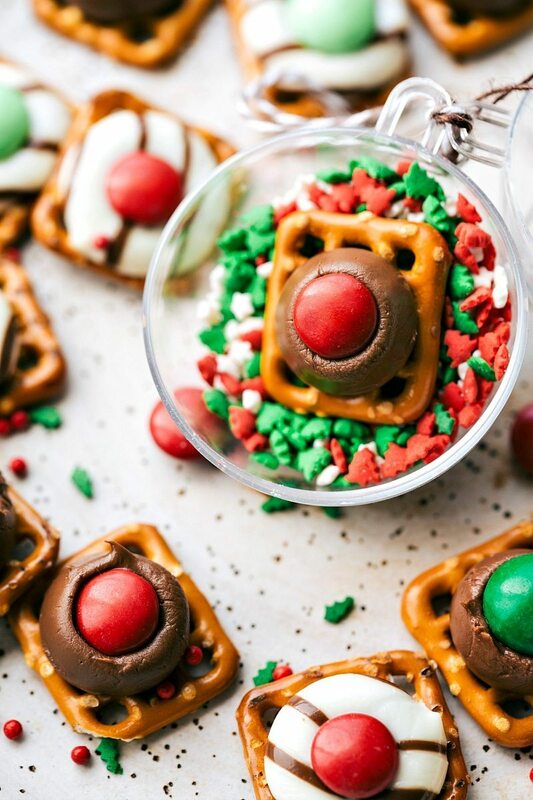 It started with making regular oreo balls and then dipping them in melted Andes mint chocolate and those treats evolved into being made into a Reese’s cup shape. SO dang good. Since you aren’t dipping the ball in the mint chocolate, you get a whole lot more chocolate which I love. Prepare a miniature muffin tin by lining with mini muffin papers. Pulse the sandwich cookies in a blender or food processor until they resemble fine crumbs. You do not need to separate the cookie from the creme. Beat the crumbs with 4 ounces of room temperature cream cheese until a thick mixture forms. Starting with 1 bag, melt all of the baking chips in a large microwave safe bowl. Microwave in bursts of 15 seconds stirring in between each burst for 10-15 seconds. Spoon melted chocolate into the bottom of the prepared muffin tins -- not a lot here. Remove the dough from the fridge and form into small balls. Flatten those balls to thin and completely FLAT disks and place on top of the set chocolate. Spoon more melted chocolate to cover the disk of chocolate. *If you want a lot of chocolate you'll go through 1 and 1/2 to 2 bags. It's hard to give an exact measurement because it all depends on the size of your oreo filling and how large your final cups are. Last but not least, we’ve got easy TURTLES. These are a classic Christmas treat and I’m not doing anything to re-invent them here. If you haven’t tried these ever, NOW is the time! 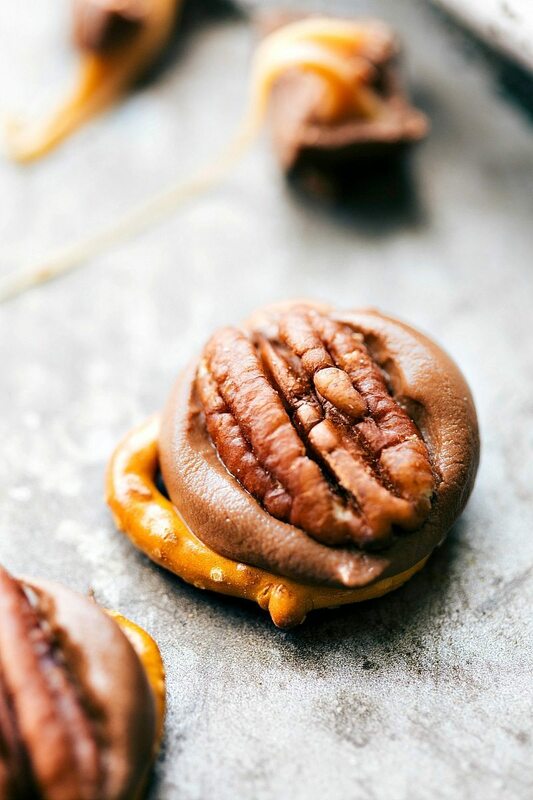 🙂 These are very similar to the “rudolph noses;” you’ll place a rolo on a pretzel and bake that for a few minutes and then press a pecan into the top. These really couldn’t get much easier! Unwrap the rolos and place on top of the pretzels. Bake for 3-4 minutes or until the rolos are soft but not melted. Press a pecan into the center of the hugs and kisses right out of the oven. **I've had a few people report issues with the chocolate "crumbling"; this means the oven was too hot or the chocolate was baked too long. I would recommend trying 1 turtle at first to test. If it crumbles, reduce the baking time for the rest. Do NOT use convection oven settings. These are so cute! What a fun Christmas treat! I copy these recipes into my word processor. If I decide to make one, I just print it out and head for the kitchen. If the recipe gets ingredients all over it, I just trash it. I can always run off another! I buy sheet protectors and put all my printed recipes in them then I put them in a binder. That way you don’t waste paper and they are right at your finger tips when you need them. I just take out the recipe I want to use and put it in my book holder while making it. If you splash anythinh on it you just wipe it off. Works great! That’s what I do, too. A quick wipe and any messy residue is gone. WHY AM I ADDICTED TO YOUR COOKING VIDEOS!? Every year my 2 daughters and I make a homemade gift for our large extended family. 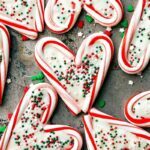 These candy cane hearts are perfect for my 7 and 4 year old to do mostly unassisted and it’s not just another ornament or decoration the family feels obligated to keep. I’m so excited!! Oh my gosh, my 6 year old is extremely excited about making those candy cane hearts for her friends. Thank you so much for the recipe!! That is so fun to hear!! You are welcome 🙂 Enjoy! I had so much fun with my toddler making these 🙂 Hope you enjoy Dee!! So, not making anything, but rather combining commercial items. I suppose it lets the toddlers do something while one boils sugar or tempers chocolate couverture. I wouldn’t use the word ‘ingredient’, which implies items like cocoa mass, yeast, flour, sugar. I would recommend, rather, admitting that this is combining snack and candy items to make decorative objects. Apparently Alecta doesn’t have any little ones to have fun making these with. That must be why she is so cranky about the “ingredients”. Or maybe it’s that pastry degree that did it to her. Whatever – I think it’s a great idea for a snack the little ones can make themselves to take to their holiday parties. Haha! You’re so sweet, thank you Lesa, enjoy making these for the little ones!! Can you freeze the thin mint cups? Although I haven’t made these yet…they will be! My granddaughter, Amelia is all on board with this!!! I cannot wait to have the grands help….looks like a good project for the day after Thanksgiving!!!! Thank you for sharing. These are great for making with my grandkids and add the perfect touch to cookie plates I’m making up for Christmas. Do Rolos work just as well for the Rudolph noses? I made the hearts and thin mint cups tonight. Turned out great and my family loved both treats! Thanks for the awesome recipes! Can you freeze any of these? Making these with my son’s 5th grade class. They are “too old” for a traditional class party, so I thought we’d have a giving party–exchange small gifts and make these candies as gifts for them to give to family. Do you think the Rudolph noses and Turtles can be done in the microwave? That sounds like so much fun! 🙂 I’m sure they could be done in the microwave, but I’m not sure how long to recommend/how many you should put in at once. I think as far as bulk and ensuring they work out, the oven is your best bet! Does it matter what kind of mini muffin papers you use for the thin mint treats. Worried about the paper peeling from the chocolate???? Nope it shouldn’t matter. I didn’t use anything special (just liners from WalMart) and had no problem taking them off. Enjoy! How do you unwrap the mini candy canes without breaking them? I tried to make the Rudolph noses, but the Kisses didn’t get soft. They just got dark and crumbly. This is why I don’t cook. ? Hi Kathy! Did you use old kisses? Anything you changed about the instructions? 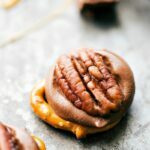 I’d love to help you troubleshoot as I’ve made these dozens of times and they are so delicious! Brand new Kisses. Everything else as directed. That’s why it’s so frustrating. I wonder if you are baking them too long; they aren’t supposed to “bake” but rather just get soft. You might have an oven that runs hot; I would try them (if you do again) for 2 minutes; maybe even 1 minute). They are only supposed to be soft enough for the M&M to push into them. If they are crumbling maybe they are being cooked is my only thought? same here. BRAND NEW bag of $4 kisses. baked 4 min. tried to push the m&d on and it didn’t work so i baked an additional min. same process for 11min. they look like garbage! Are you baking them too long? Are you heating your oven convect on regular? I can’t see why they would be crumbling. Did you use regular kisses? The oven isn’t supposed to bake them, it’s just supposed to make them soft enough to press an M&M in it. I would try pulling them out at 2 minutes. Or you can try heating them in the microwave until they are just barely soft enough to press an M&M in. followed you directions, so unless your instructions are wrong i’m not sure how. i followed the instructions, not that difficult. I just tried the Rudolph nose treats. My first ones came out crumbling too. So I changed my oven to regular, not convection, and left them in for 1 minute. Then they came out perfect! Thank you so much for sharing Chris! That helps to answer why some people might have had the crumbling; I added a not to use a conventional oven setting. Thank you! Do the Oreo mint cups need to be stored in the fridge? Try Rolos for those reindeer noses. They work very well and so tasty! wish i would’ve seen this before i wasted an entire bag of kisses! I love these holiday recipes! Question: did anyone while making the reindeer Moses have trouble melting the kisses? My first batch was great. My second and third batch- the kisses didn’t melt :/ I’m assuming there’s something wrong with the chocolate? Please let me know! Made these yesterday and today. Made them for the teachers gift and to bring to friends who invited us over for Christmas Eve breakfast. They were so simple and easy. I just had the kisses and rolos in the oven for 3 minutes and they came out perfect. I have to say I was feeling lazy and just placed an Oreo in between layers of melted Andes mints and they’re excellent. Thanks for sharing I think this will become a Christmas gift giving tradition. I am really excited to try these recipes. I was wondering how far ahead can you make like the turtles and things. I am having a party and would like to make these and wonder if I can make them a few days ahead? How long do the noses and turtles take to get hard? Can I refrigerate them over night? Do I have to use cream cheese for the mints? Can I use butter instead (obviously not as much)? Kind of like making a graham cracker crust. Hmm, I don’t think that would work out as well or taste right unfortunately. Cream cheese is a lot stickier than butter! For the candy cane hearts, does the chocolate have to be piped? or can you use a spoon to do the filling?